Today I went with a friend to the Mitarashi festival at Shimogamo Shrine. This was at least the third time I went there, but it seems I haven’t written about this before. Time to fill the gap then! The Mitarashi festival is an extremely popular festival in Kyoto, and thousands of locals go to Shimogamo Shrine each year to celebrate it. It is very interesting and “hands-on” and there are several steps involved. First, you go to the shrine to pray as usual. Then you turn to the little stream and pond of the shrine that is usually off-limits. You take off your shoes, buy a small candle and then wade through the waters of the stream. Somewhere in the middle of the way, you light you candle, and then you walk with your candle to the end of the stream and place it in front of a tiny little shrine. Some people say another quick prayer there. Don’t let the candle go out – you will have to go back and light it again! (Using somebody else’s fire is frowned upon.) The water is ice-cold, which is nice for a short time, but can get very unpleasant if you have to go back and forth more than once or twice. The idea of the ritual is to pray for good health over summer, and bathing your feet in the cold water definitely helps to cool you down for a while. After you step out of the stream and put on your shoes again, you can drink a cup of fresh water from the shrine’s own well. 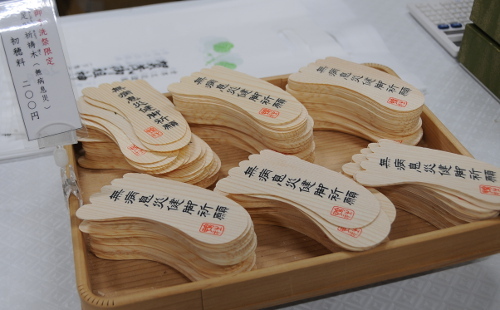 And there are also little bamboo sheets in the shape of feet for sale, where you write down the names and dates of your loved ones in order to pray for their health as well. 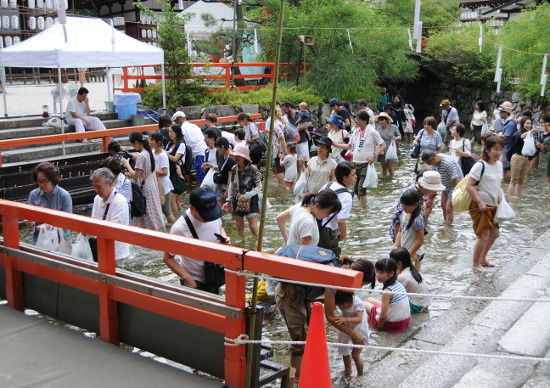 Those are put in the water in front of the little Mitarashi Shrine I mentioned before and will be floated down the stream to take the ailments of the people with them. As I said, this festival is immensely popular, and it lasts about one week each year in July. It opens at 5:30 in the morning and ends only at 9 in the evening, and especially after sunset, there are always lots of people. Many of the smaller kids who come with their parents take the opportunity to splash about noisily in the water, they don’t seem to be concerned about the cold at all. The officials of the shrine don’t seem to mind that, after all, shinto is meant to be a celebration of life. I really enjoy visiting the Mitarashi festival, and so far, this has been the only festival in Kyoto where I went to each and every year. And I hope that there will be many years to come!